Back in 2016 I attended Cisco Live for the second time but my first as a Cisco Champion. There were not many Cisco Champions in Australia at that time. I believe it was 4 in total, and three of us were due to be at the Cisco Live. Chris Partsenidis was another Cisco Champion based in Melbourne and I was looking forward to meeting him. Prior to the event Chris reached out to me so we could meet up at some point during the week. Unfortunately for Chris has got caught up with network outage issues (Cisco related 🙂 ) that week so he was unable to attend. I met with a Cisco rep that was over from California for the event and collected the Cisco Champion swag which included a Cisco Champion shirt. Following Cisco Live I arranged to meet with Chris over a coffee to exchange the prized shirt. And this meeting is what led to the Cisco Data Center User Group in Melbourne. Over a coffee Chris and I spoke about how we were both relatively new to Melbourne and how we were struggling to find a user group that covered the topics we were interested in. Chris is a network Cisco Champion and I am a data center Cisco Champion. I had been to a number of other user groups and I really enjoyed the VMware User Group (VMUG) so something similar to that was what I had in mind. Chris agreed and so we reached out to Lauren Friedman from Cisco. Lauren has been trying to get something similar going for Cisco at a global level and so we took on the Cisco Data Center User Group for Melbourne and essentially became a guinea pig. We agreed on a format of a vendor and community session, times for each of the presentations and the frequency of the sessions. Since the initial session we’ve had 19 more over the course of the two years and it’s being going solid since the start. I think there’s people out there who’ve been running such user groups for much longer than I have that can provide a more exhaustive list of challenges. My own list is slightly reduced compared to others by that fact that Cisco provide sponsorship and help to cover the costs. For a lot of other user groups this is the biggest challenge. Being able to cover the bills is always the challenge as ‘free’ does not necessarily mean ‘free’. Getting people in the door – trying to keep the attendee numbers up is always a massive challenge. There’s a number of reasons why the numbers go up and down, whether it’s the season, weather, holidays, or attendees have moved on in their careers. Consistency – Ensuring that the meeting is held every month on the first Tuesday and keeping to that. This has meant the regulars know what day the user group is on and can associate it to a specific day. We’ve taken the decision to miss a month’s event due to holidays that fall on the day or near the day we normally run the user group. This has worked out well for us. The key is to let the users know well in advance. Legacy – There’s always an issue with keeping the group going and ensuring that as the key organisers move on the group remains running. I’ve spoken to a number of other user group organisers and they have had the same issues. This is something the DCUG has thankfully not really had to deal with yet but the day will come and we need to ensure the group remains true to its core purpose. That’s a bloody great question. Right now we’re in the process of working out what the long term goal of the group is and how we can meet the needs of the attendees. The user group has a relatively stable number of attendees every month and it’s a great mix of regulars and new-comers. This is great from a people networking perspective as there’s always someone new to talk. We want to group to continue being of benefit to the community and being of value. Bringing quality sessions and presentations to the user group is a key driver and creating a space where technology topics can be digested as easily as the beer and food. We want the group to grow and evolve to meet the market changes in enterprise IT and the preferences and interests of the user group. It’s been two great years being involved in the user group and its means so much to see if continue to thrive as it rolls towards its third year and further. Long live the DCUG!!! 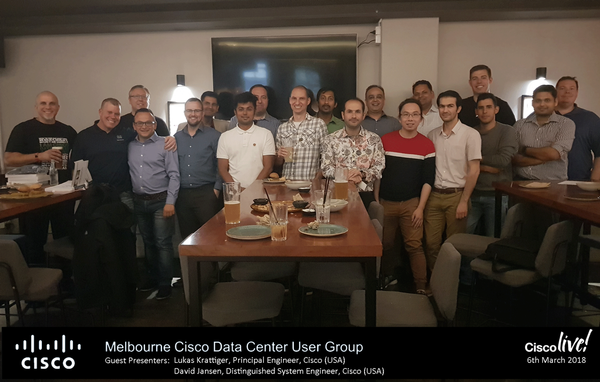 This entry was posted in Cisco, Community and tagged Cisco DCUG, Cisco DCUG Melbourne, Community, DCUG, user groups. Bookmark the permalink.